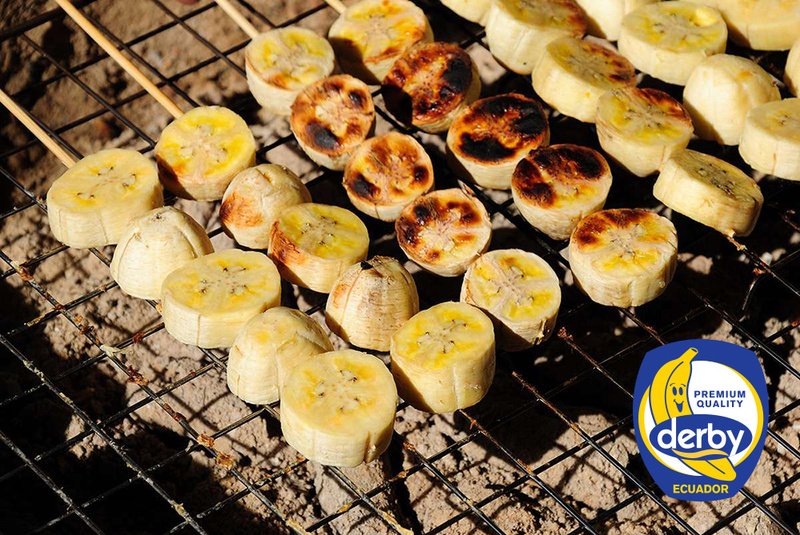 Bananas sausages on barbecue | DERBY® PREMIUM BANANAS RASTODER Company - DERBY bananas and other fresh FRUIT and VEGETABLED for you! Do you know that sausages match bananas? You may not expect a combination in Mediterranean destinations, but if you visit Asia, you can make sure that such sharp-sweet combinations are still common. Let us accompany you in the world of exotics. Marinade: Mix the soy sauce, pineapple juice, pepper, garlic and parsley in a mixer and make a smooth mixture. Then cut the sausages into quarters, parsley, bananas, green and red peppers cut into pieces (preferably 16 equal pieces). Put all ingredients on the slices and bake for about 8 minutes. Rotate and lubricate the marinade while cooking. Serve with pieces of lime.